Dentures are a way of replacing missing teeth to give the patient a natural smile again – and are most commonly known as “false teeth”. With today’s modern technological advances in the dentistry field, there are now more options to offer patients who have lost a few teeth to all of their teeth. There are now techniques to stabilise your dentures in order to prevent the embarrassing situation of your dentures feeling loose and uncomfortable. 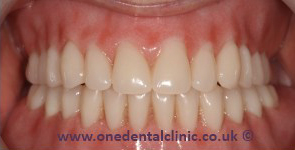 Our Solihull clinic provides a range of options for Dentures, so please enquire for more details. Partial/Complete – Removable dentures that can be ideal at replacing a few missing teeth to a full lower/upper arch of teeth. Partial with precision attachments – securely replace missing teeth that are connected to the adjacent crowned teeth. Very comfortable and does not use unsightly clasps! Tooth Supported – Full overdentures are made to fit on the remaining roots. 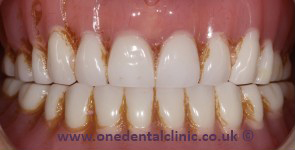 Implant Supported – Full overdentures are securely attached and stabilised onto dental implants. 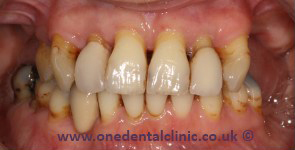 This patient suffered from gum disease affecting the upper teeth and wore an upper partial denture. 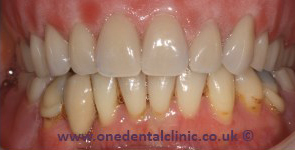 The upper teeth were removed and 4 implants placed following Ct scan planning. The implants were splinted together with a bar and an overdenture was provided. Our Clinical Dental Technician (Kevin Thomas) is accredited by the Royal College of Surgeons and has been creating beautiful smiles for over 35 years! Having the perfect denture and your dream smile is a very rewarding and interactive treatment, where your input is valued and listened to throughout the whole process. If you would like to start the journey towards new teeth and a new smile, please do not hesitate to call and speak to our dental team to arrange your free consultation today!